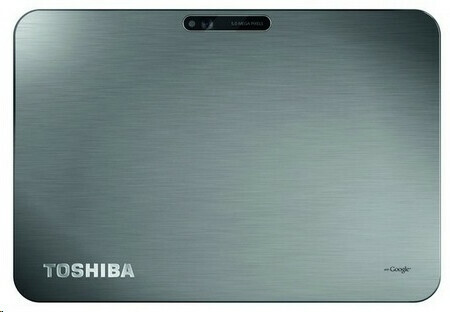 Before it appeared at the IFA Berlin show last month as the Toshiba AT200 for the European market, it was rumored as the Toshiba Excite, but now the thinnest 10" tablet in the world is officially introduced as the Toshiba REGZA AT700 in Japan. 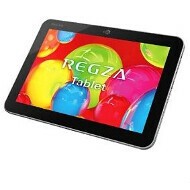 Name confusion aside, at 0.3" (7.7mm) and 20 ounces (558g), the 10" Toshiba REGZA AT700 is the most compact and lightweight 10" tablet out there, beating the iPad 2's 0.35” (8.8mm) profile, and the 0.34” (8.6mm) of the Galaxy Tab 10.1. We are talking iPod touch slimness, which is a remarkable achievement, considering that the slate is crafted out of single sheet of aluminum, not plastic, for added rigidity. Besides the beautifully crafted body, the REGZA AT700 sports a 10.1" 1280x800 pixels LCD display, 1.2GHz dual-core TI OMAP4430 with 1GB of RAM, 5MP rear and 2MP front cam, and 32GB of internal memory. MicroUSB, microSD and HDMI are standard. The anorexic slate was introduced at the CEATEC expo in Japan, and will be available for sale there by year-end, hopefully the AT200 for Europe and, eventually, US, will stick to the same timeframe. A 7-incher was also announced, the Toshiba REGZA AT3S0 (boy, these names Japanese-bound titles are uninspiring), which is pretty light at 13 ounces (379 grams), but the thickness is considerable at 0.48" (12.1mm). In fact, it suspiciously reminds us of the Toshiba Thrive 7 tablet, and is probably just its Japanese edition, ready to go on sale at the end of this month. Now, we're talking! i'd take this over a Galaxy TAb any day! Will you even buy it when there's such of tablets? Looks great. Another strong competitor for Samsung and Apple comes from long hibernation. Sharp will join this fight as well. The TI 4430 dual core is a good bit of kit, but its 8 months old already... Bring the Kal-el please!